I’m not sure why I have persevered with certain plants but this is the year I devote my energies elsewhere. I’m currently reading the wittily written book Outwitting Squirrels by Anne Wareham (review to follow in the next few weeks). Two of Anne’s tips which I have taken to heart are ‘to be ruthless enough to throw out miserable plants’ and ‘to be brave enough to change course if something is turning into far too much trouble’. It seems simple advice but one many gardeners find hard to follow, including myself. For years I have admired the tightly rolled, spear-like leaves of hostas emerge in spring. For a short time their new leaves unfurl, pristine and beautiful, but this stage is fleeting. As spring merges into summer they become increasingly studded with holes, looking increasingly like lace doilies, devoured by the mouths of slugs and snails. My hostas have been grown in pots, hostas in the border would be like treating them as sacrificial lambs. I tried copper tape last year around the pots. It didn’t work. As it was sold specifically for that purpose perhaps I should have made a complaint under the Trade Descriptions Act. 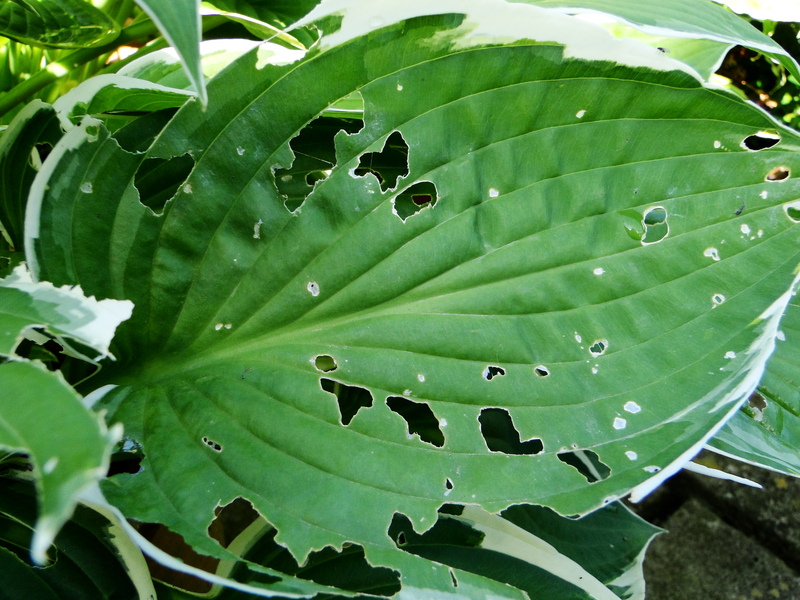 I noted with interest that Monty Don on last week’s Gardeners’ World suggested hostas which are attacked by slugs are stressed plants. There’s certainly something in a slug’s homing instinct for the runt of the litter and the weakest plant in the row, and perhaps my pot-grown hostas didn’t have enough food and water. I did look on with envy at his pristine, hole-free hostas just as I did when I visited Prince Charles’ garden at Highgrove and saw his immaculate hostas. Its neighbour the blackcurrant has gone too. There were two blackcurrant bushes but it’s too much for us. We don’t make jams and blackcurrants need so much sugar to make them palatable that they tend to languish in our freezer rather than being eaten. Instead a blackberry bush will fit nicely into the space now created by the absence of the gooseberry and blackcurrant. I prefer fruit I can eat without the need for extra sugar – anything that I can scatter on my porridge is ideal. The tayberry, blueberries and strawberries are perfect for this and I think a cultivated form of blackberry will make an excellent accompaniment. Why grow a blackberry when there tend to be plenty to pick from the hedgerows? Foraged blackberries are often quite small and their quality is very dependent on the weather we have. A dry summer tends to produce small fruits with very little juice and a wet summer often results in watery fruits with little flavour. 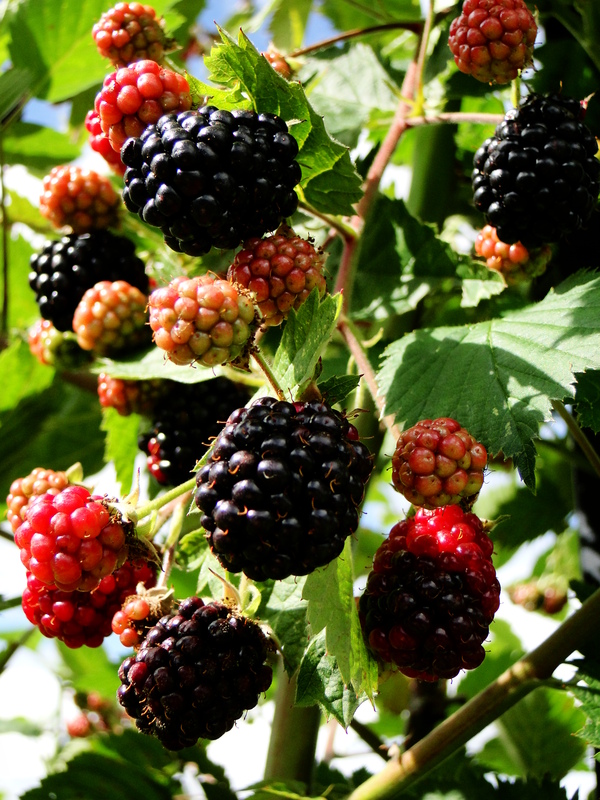 The benefits of growing a cultivar are bigger, juicier fruits and a stronger blackberry flavour. Hedgerow brambles are incredibly vigorous plants, as anyone who has tried to get rid of a patch of them will know. Many of the cultivated versions though are much better-behaved, and some can be grown in a relatively small space, especially if they are trained up against a fence or wall. We’ve chosen the variety ‘Waldo’. Choosing a thornless variety was essential after the problem with the gooseberry and the online reviews all suggest this is a heavy yielding cultivar with great flavoured berries. 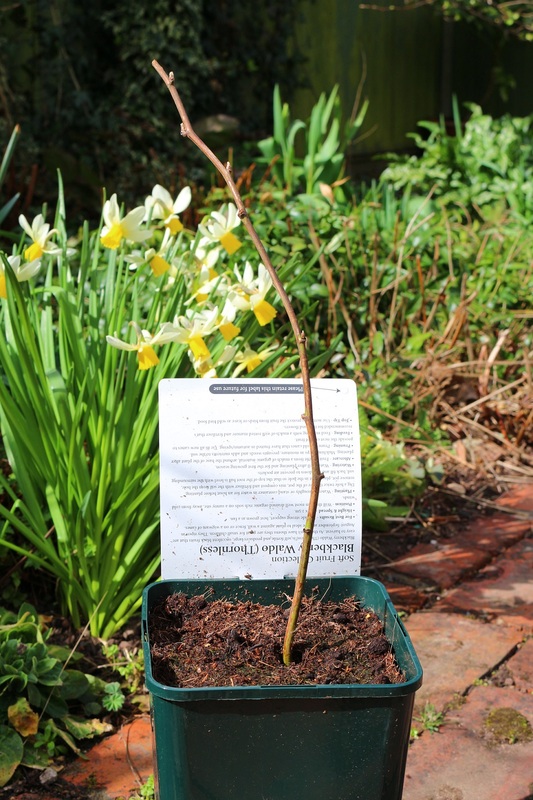 It takes a certain leap of faith to buy a pot with one unpromising looking stick planted in it and it’ll be next year before we get any fruit as a blackberry fruits on two-year-old canes. We managed one tayberry fruit in the first year of planting. The excitement at this one fruit was enormous and it was halved for us to both try. Perhaps we’ll get a tantalising taste this year too, if not this impatient gardener will have to wait until next summer for the taste of home-grown blackberries. I’d love to know if there are any plants you’ve decided aren’t worth the trouble or you’ve persisted in growing even though you don’t really eat them. It’s the vernal equinox this week. Not that it has felt especially spring-like, thanks to a chilly blast of weather from Scandinavia. There was a dusting of snow on the North Pennines and an icy wind coming in off the North Sea this weekend, so I was glad of the winter woollies I’d packed for the trip to visit family in the north-east. And it hasn’t felt much warmer now I’m back at home. Despite this the garden is taking on the appearance of spring, and the birds are singing and foraging for nest material. It’s worth not being too thorough in your spring tidy of the garden as dried leaves, grasses and small twigs will come in handy for garden birds building their spring homes. I watched a blackbird this morning gathering leaves from my path and flying off with them, which is much more preferable than the decimation of a Stipa tenuissima plant by house sparrows a few years ago. They pulled out the bleached blonde grass and flew off with their bounty in their beaks. I consoled myself with the knowledge that they would have a softly-furnished nest. As for scent in my garden. Well, it’s that cross-over period between seasons, so the winter-flowering honeysuckle, sarcococca and viburnums are still flowering and filling the air with scent. In fact, March is perhaps the best time of the year to appreciate their perfume as those first warm days of spring mean their fragrance carries much further. Daffodils have now taken centre stage as the snowdrops fade. 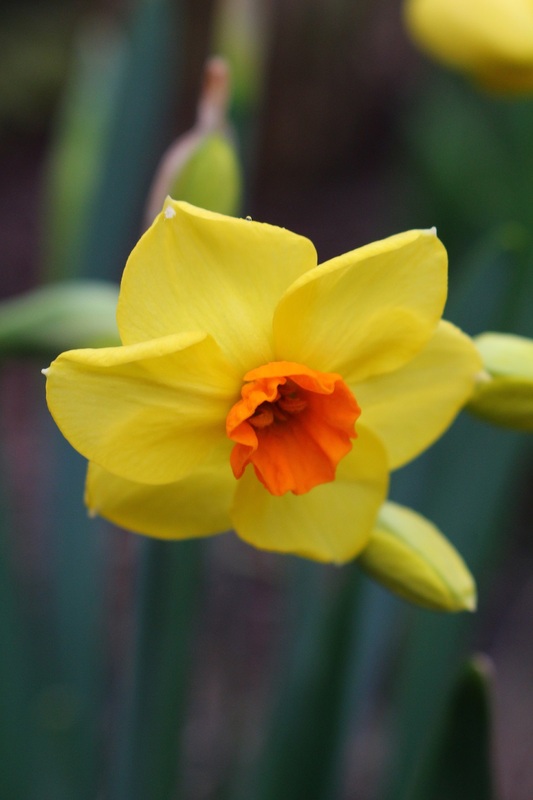 Most narcissi have a fragrance but some are stronger than others. Several years ago whilst on a break in Cornwall we came across a field of daffodils. I hadn’t seen such a sight before, with so many planted en masse. The sight of golden fields was spectacular, but it was the scent which was so surprising. I’d never really given any thought to how the daffodil fields would smell. The aroma was so strong it drifted across the road to the car. I’d wound down the window to get a better glimpse of the field but it was the perfume that took my breath away. Picking a bunch of daffodils and bringing them indoors is the best way to appreciate their scent, particularly if it’s a cold spring. Most people are understandably reluctant to pick flowers from their garden, not wanting to denude it of any beauty. Devoting an area especially to spring bulbs for cutting is a real treat and worth doing if you can free up some space. 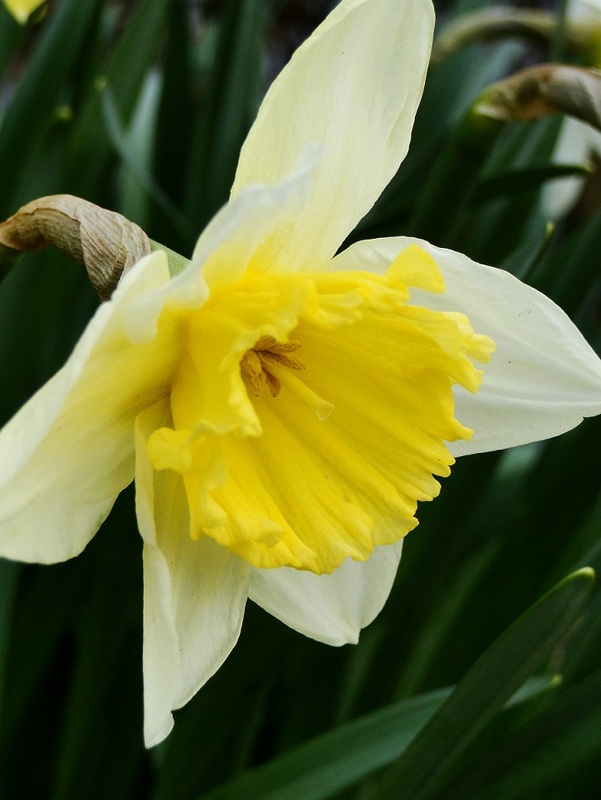 Plant small rows of at least six varieties of daffodils – choose ones which flower at different times and you’ll have a good spread of blooms for picking. I didn’t plan for this last autumn because I wasn’t sure whether I’d be keeping the allotment and now I’m really missing having some daffs to pick for the house. However there is a good show in the garden. ‘February Gold’ should really be renamed ‘March Gold’ as now is the month when it seems to reliably reach its peak. I tend to prefer the smaller flowering varieties such as ‘Jack Snipe’ and ‘Tête-à-Tête’ in a garden setting rather than the bigger, bolder flowers commonly planted in large drifts by councils. ‘Ice Follies’ however has made its way into the garden via the allotment cut flower patch. It’s very pretty with its ivory petals and pale lemon trumpet and has a fabulous perfume. Scented narcissi are the ones which really pack a punch with their perfume and these are my true favourites. They tend to produce flowers on quite tall stems so maybe aren’t everyone’s cup of tea for the garden but if you’re after spring scent they are hard to beat. The first to open in the garden is ‘Grand Soleil d’Or’. I have only ever grown hyacinths as forced bulbs for late winter/early spring flowers indoors. It’s taken me a while to learn to love their perfume. I found it too powerful when I was a child and used to avoid the room where my mum kept her hyacinth displays. 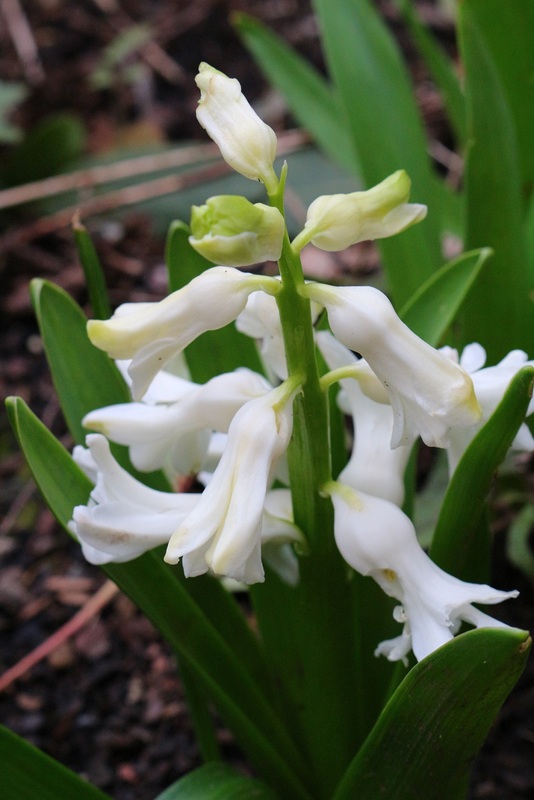 As for outdoors, I’ve never really been convinced that the stubby form of hyacinths lends itself to the garden border. However last spring I shoved a few of the forced bulbs in the ground once they had finished flowering. Mainly this was because I was intrigued as to whether they would actually come back – it’s often suggested they won’t because of the special treatment they need for forcing. Well they have reappeared and I rather like the white flowers of ‘L’Innocence’ in the garden. Many years ago I visited Upton House in Oxfordshire and in a narrow alleyway on the way into the gardens was a large stone planter packed with hyacinths. The impact of the fragrance was quite incredible and something I’m now thinking I’d like to replicate next spring. For more scented inspiration for spring take a look at my piece on sweet violets in The Guardian. A traditional cut flower, both here and in France, they’ve sadly fallen out of favour, but there are some fabulous varieties out there. I’m hoping a small patch of these will be another addition to my scented garden in the future. It would be lovely if you would join in this meme and share the plants which are delighting your nose at the moment. In a world where the way we shop, cook and eat is changing a growing number of innovative farmers are looking at unusual crops which can be grown in our climate. The Wasabi Company, based in Dorset, is a fascinating example of this. Wasabi has been grown and eaten in Japan for thousands of years but it has only really come to our attention in Britain as the popularity of sushi has grown. It’s a member of the Brassica family with a flavour similar to horseradish, although the two are not related. In fact, most people in Britain who think they have tried wasabi probably haven’t. Many of the ‘wasabi’ products for sale or those used in pre-prepared foods contain only a very tiny amount of wasabi and are actually made up of horseradish and mustard powder. I had never tasted wasabi, real or otherwise, in fact I’ve never even eaten horseradish, so when I was asked if I would like to try some from The Wasabi Company I thought, why not! It’s the chunky rhizomes which the plant forms just above ground that are grated to make the wasabi paste. I’ll admit I was a little dubious. I had heard of its reputation to be quite potent and for someone who is a self-confessed chilli wimp I was a little trepidatious. Well, it turns out it’s not as hot as I thought it would be, which in my opinion is a good thing. I’ve never really understood why people love super hot chillies which overwhelm your taste buds and render the rest of a meal virtually tasteless. The heat of wasabi is much more akin to a mustard rather than a chilli and I really liked it. Would it be actually be a useful product was my next question? I love to cook but I’m becoming a little weary of recipes which require a whole gamut of weird and wonderful ingredients. They are all generally very tasty, but once opened they often have such a short shelf-life which means you need to eat the same ingredients every other night for a month to use them up, or gain an increasingly eclectic bunch of jars, bottles and tubs in the fridge which are never finished. I imagined it only working with sushi but it turns out it’s actually very versatile. We had it mixed into puréed peas with crème fraîche served with scallops which was delicious, but I was intrigued as to whether it could be used in more day-to-day food. I loved it added to mayonnaise which tasted fantastic with cray fish and it even worked in my humble egg mayo sandwiches. So rather than the rhizomes festering in the fridge they were actually a quick and easy way to add flavour. Apparently you can add it to mashed potato too. Fresh wasabi needs to be finely grated into a paste to release the flavour (this is not the time to use the cheese grater). The Wasabi Company sell special wasabi graters, (although a microplane would be fine) and a little brush is used to remove the paste from the grater. The flavour lessens within 15 to 20 minutes so it’s best to prepare wasabi just before you want to eat it rather than in advance. It’ll look much paler in colour – a pale green – than any shop-bought wasabi which has colourings added to it. As for growing my own. Well it’ll take some time to tell whether it’s a suitable plant for home-growing. It seems it can be a tricky plant to cultivate, particularly on a large-scale. In Japan it grows beside cool mountain streams where it is flushed with clear, nutrient-rich water, similar to watercress. This type of growing is known as sawa wasabi and is the most sought after. It’s taken several years of research and trials for The Wasabi Company to get the growing conditions right and as they have over 120 years of experience growing watercress they are certainly well-placed to make commercial cultivation a success. These aren’t conditions I can replicate at home, so I’ll have to make do with growing oka wasabi (soil-grown). It needs lots of shade, doesn’t like extremes in temperature and is hardy down to -5°C. 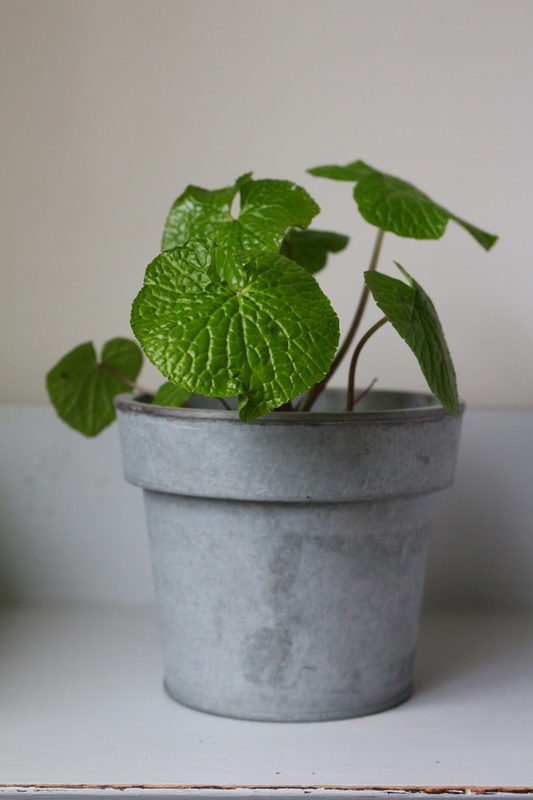 The young wasabi plant came wrapped in hessian and was the size of a good-sized plug plant. Advice is to pot up into a 9cm pot initially so that it can establish a healthy root system. I’m in garden limbo at the moment so mine will have to live in a large pot for the foreseeable future but I’ll have to make sure it’s kept moist and given a regular feed. An attractive plant in its own right with pretty heart-shaped leaves and delicate white flowers (apparently they’re scented) it could make an excellent addition to a forest garden where shade-loving crops are hard to find. Wasabi will grow to about 60cm tall and it’ll take a few years at least for the plant to form good-sized rhizomes which are ready to lift and eat, but the leaves and stems are also edible. Sounds like a fantastic crop for cooks and growers. Fingers crossed it’s happy growing in Wales. Thank you to Sophie at Pam LLoyd PR. 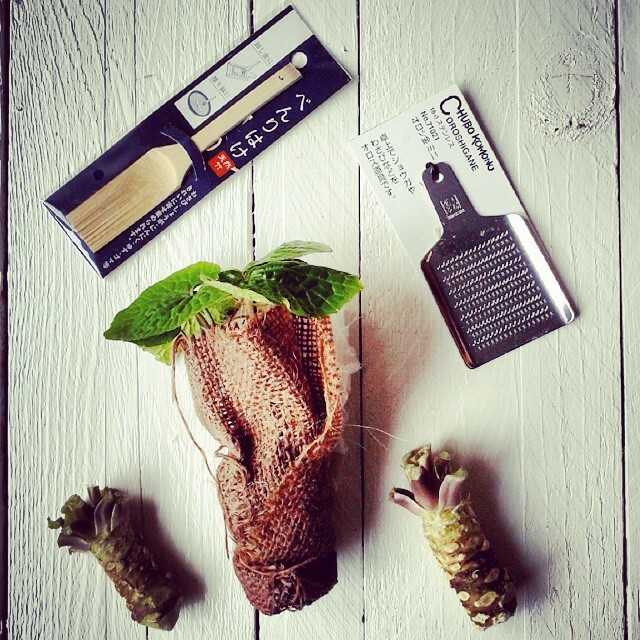 For more information, recipes, how to buy the rhizomes and your own wasabi plants go to The Wasabi Company.